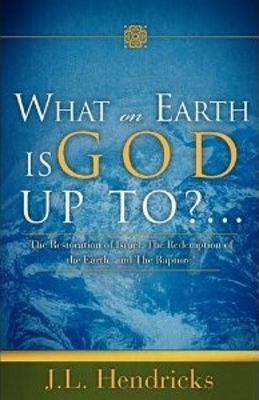 "WHAT ON EARTH IS GOD UP TO?..." Or Buy at Amazon Now! "WHAT ON EARTH IS GOD UP TO?..." (220 pages), author J.L. Hendricks, Xulon Press Publishers (Publication Date: June 18, 2009). This book examines six major passages of scripture dealing with the second coming within their context. Included in this is an overview of the Book of Revelation. Most books on the subject bounce from verse to verse making the study of end-time prophecy difficult to follow. The subject of the second coming and the rapture has proven to be confusing to many, but, by keeping the pasages in focus, the reader can more easily follow what the Lord and the Apostles are teaching. In this book, two primary teachings are dealt with: the rapture and how it impacts the future role of Jewish people with the Gospel of Christ. Understanding when the rapture occurs: before, during, or after the Great Tribulation is crucial to our undestanding of what God has planned for Israel in the coming future. If we don't understand the timing of the rapture, we absolutely cannot understand the future role of Israel in the Kingdom of God. If we don't understand Israel, we cannot adequately understand the Second Coming of Christ and its related events. Also addressed in this book is the emerging Messianic movement within Christianity; what role it will come to play in the gospel, and what some of the issues are confronting the movement. Cost: $9.95, plus $3.00 shipping and handling.